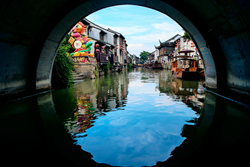 Today, Suzhou Tourism announced the successful completion of its year-long, global social media campaign that ran from June 2016 through May 2017 and targeted North American travelers – “A Curated Look at Suzhou’s Arts & Culture – No Visa Required.” The program reached more than 38.6 million consumer impressions through social media and 3.1 billion consumer impressions total across all media outlets. Utilizing core engagement tactics, Suzhou Tourism implemented a comprehensive social media strategy that included content creation, monthly giveaways, four offline and four online events, and engagements with consumers, media, travel professionals, and influencers, to increase visibility and awareness for the destination across a variety of online platforms, specifically its website, TravelToSuzhou.com, Instagram, YouTube, Facebook, and Twitter. Suzhou Tourism utilized the most influential social media channels in North America to create excitement for its unique positioning among a passionate audience of new consumers. The channels indicated that North American travelers showed a great appreciation for scenic images of Suzhou, specifically those of the city’s classical gardens and water towns, and experiential travel offerings such as crafts, culture, cuisine, and festivals. Collectively, the social media channels gained more than 400,000 new followers over the 12-month time period, while the official hashtag, #TravelSuzhou, was used in more than 8,200 social media posts. Four impactful online campaigns capitalized on the theme of arts and culture to generate excitement for Suzhou across Facebook, Twitter, and Instagram. The most popular online event, the “Suzhou Noodles” contest on Instagram, leveraged the ever-trending theme of food to reach “foodie travelers” across North America. The contest generated more than 370,600 impressions, reaching nearly 200,000 social media users. Additional online campaigns included a “Life in Suzhou” Twitter contest that promoted the authentic local lifestyle; an interactive television and online video segment on the program Modern Living With Kathy Ireland®; and the “Spring Into Suzhou” Facebook contest that highlighted the quintessential season in Suzhou. Creating a continuous synergy for Suzhou Tourism among online and offline audiences, a series of events were hosted in key North American markets to increase awareness of the destination among influential consumers, travel trade, and media. Tying into worldly events, the most impactful of the four events was the celebration of I.M. Pei’s 100th birthday on April 26, 2017. The day’s activities included a luncheon with 38 members of the travel trade in Boston, Massachusetts at the JFK Library and Museum, which was designed by Mr. Pei; an interactive photo station ‘with’ Mr. Pei; and an online contest. The social media hashtag created for the centennial milestone, #IMPEI100, was used in more than 900 posts across Facebook, Instagram, and Twitter. Public relations promotion of the events resulted in more than 200 articles, reaching more than 205 million consumers. The additional offline events included “A Cultural Connection Between Suzhou, China and the de Young Fine Arts Museums in San Francisco, California” including a partnership for the “Friday nights at the de Young” event series with more than 1,500 attendees; “A Taste of Suzhou” featuring an interactive tea tasting booth at Wharf Fest in San Francisco, California, which attracted more than 8,200 consumers; and “Far East Meets West,” a partnership with The Getty Museum in Los Angeles, California where more than 50 travel agents and tour operators attended a luncheon. Excitement for these outreach efforts – both digital and offline in their approach – reached overseas and domestic media audiences. Significant press coverage for the campaign was produced in outlets across Canada, the United States, and mainland China including Shanghai Morning Post, China Tourism News, Travel & Leisure China, CCTV, Miami Herald, Boston.com, E-Global Travel Media, New York Post, Travel Agent Magazine, and many others. Overall, more than 3,000 articles discussing various components of the campaign were published – further enhancing the global visibility of Suzhou. Suzhou Tourism’s enhanced presence across social media over the past year leveraged an initial five-month campaign in 2015/2016 that successfully launched the destination’s YouTube and Instagram pages. The momentum ensured that stories of the city’s unique programs were communicated directly to key audiences, positioning Suzhou as a “must-see” destination for North American travelers who are considering a trip to China. Additionally, the dedicated social media program runs concurrently to a destination awareness campaign in North America featuring public relations, travel trade, marketing and websites initiatives.